280克国旗红阻燃纱卡 - 100% cotton flame retardant fabric-flame retardant fabric-Products - Xinxiang Yijia Textiles Co.,Ltd. Yijia flame retardant fabric: the flame retardant performance has been tested by ITS, SGS, MTL, TUV, national labor protection quality inspection center and other domestic and foreign authorities, and can reach EN 11611(i.e. Original EN 4707-1),EN 11612(i.e. EN 531),EN 14116(i.e. EN 533)，EN 61482, NFPA 70E HRC grade 2, EN 479, national standard GB8965.1-2009. 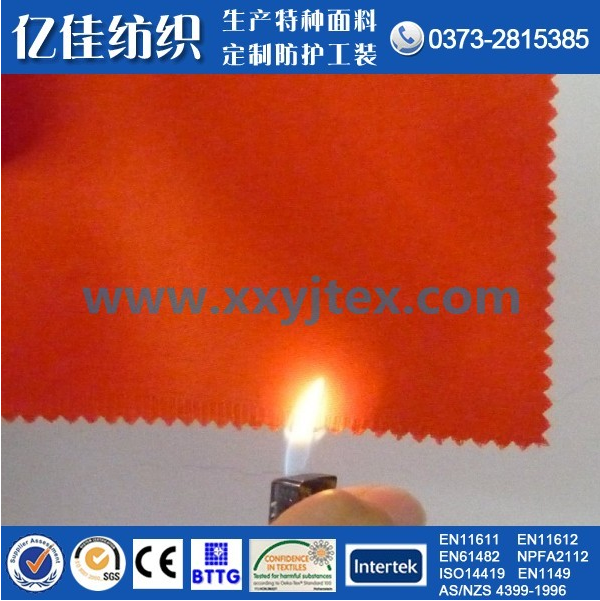 Yijia 100% cotton flame retardant fabric fireproof cloth is widely used in metallurgy, casting, welding, electric power, nuclear industry, fire control, chemical industry, petroleum and other industries. It can also be used for decoration of hotels, restaurants and opera houses.